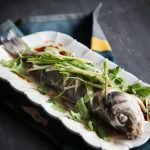 Learn how to make Hong Kong style Cantonese steamed fish with silky smooth flesh at home with all the pro tips you wish you know earlier. Clean fish by rubbing some salt on the skin and inside. This will help to remove fish odor and retain moisture and freshness of the fish when cooked. Rinse off an pat the fish really dry with absorbent paper towel.